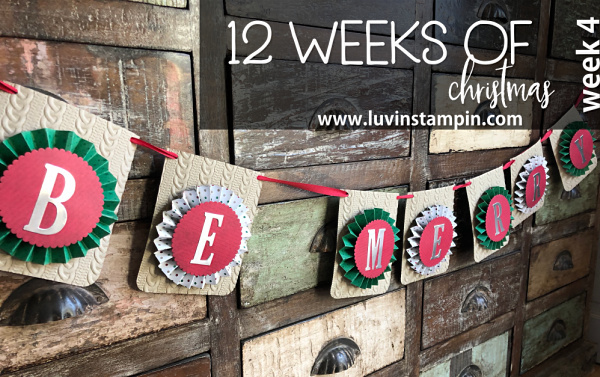 Today’s project for the 12 weeks of Christmas is a DIY Christmas banner. This banner is so simple to make. I have a free exclusive video tutorial for all of my email subscribers. 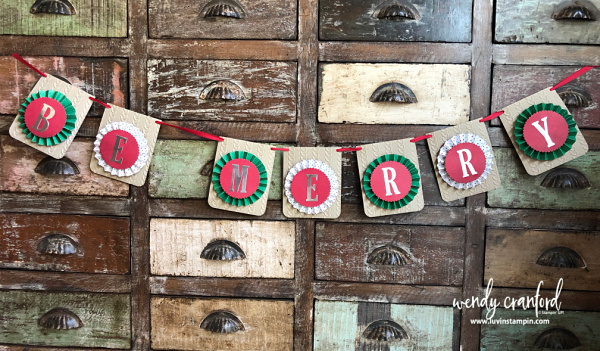 + Use a hot glue gun for all the rosettes, adhere the 2″ circle punch to the back of the rosette to hold it together before adding it to the banner piece. Supplies used to create this banner are listed below. The one MUST HAVE supply in this list is the Simply Scored scoring tool. No matter what level of crafter you are, this is an essential tool to have in your arsenal of crafty magic supplies. Click on any of the images to purchase them in my online store. I think of every order as a personal THANK YOU for my work sharing tutorials on You Tube and my blog. You have no idea how much I appreciate your business. Don’t see what you are looking for? Or maybe you’ve already purchased all the goodies listed because you are a Stampin’ UP! shopper like me. Click the link below to shop all the items in my online store. I love this banner!! It doesn’t seem too difficult to make, thanks for the tutorial! Great banner idea Wendy! Thank you! I love your Christmas banner! Thanks so much for sharing it and allowing us to share with others! Awesome!